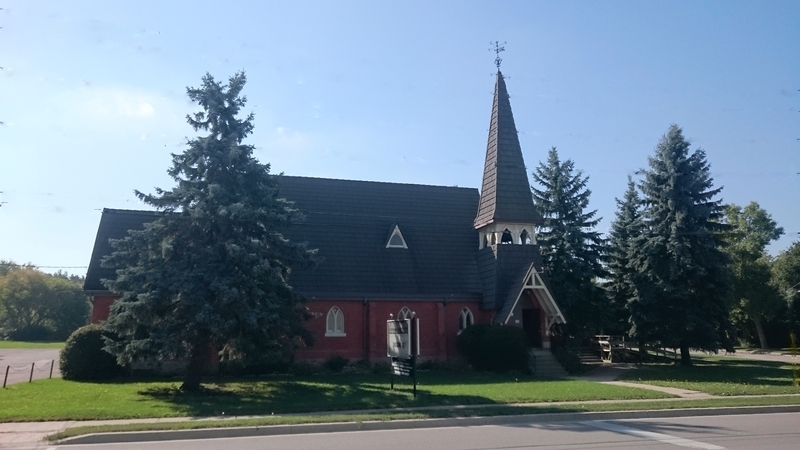 The services of the Anglican Church, Allandale, Ontario, were started in the year 1872, in a building known as the Orange Hall, which was located at the south end of Essa Road, on the left-hand side, on the property later known as the Leslie property, or the Golf Club. Shortly afterwards, services were held in the old North and North-Western Railway station, which was located at the corner of Holgate St. and Essa Road. At that time, Allandale was not able to support a full-time minister, so the Rev. E.W. Murphy, B.A. rector of St. Paul’s and St. Peter’s Churches, Innisfil, seeing the need of the people of Allandale, held services every other Sunday in these buildings, and carried on in this manner for ten years. Mrs. Murphy was the organist and choir leader. None of the landmarks referred to still exist. 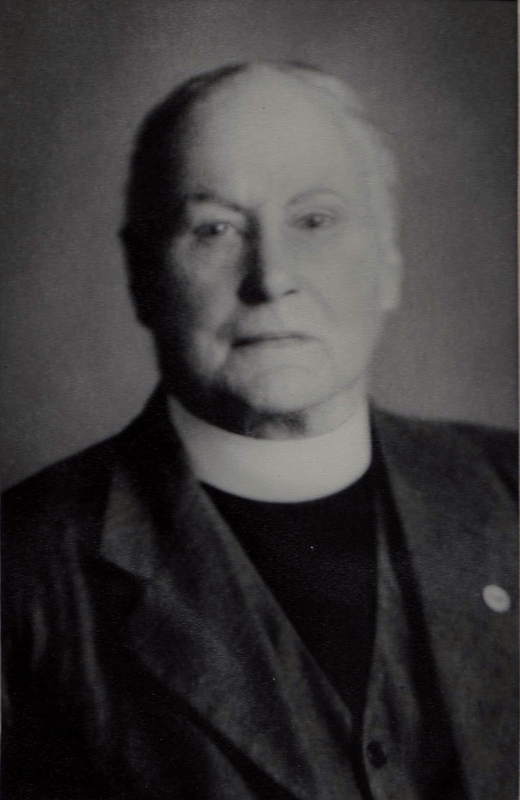 In 1882, services were discontinued for a short time, and then Canon Edward Morgan, who was then Rector of Trinity, Barrie, began holding services in a house located at the corner of Burton Ave. and Essa Rd. (The original building was removed for a gas station.) 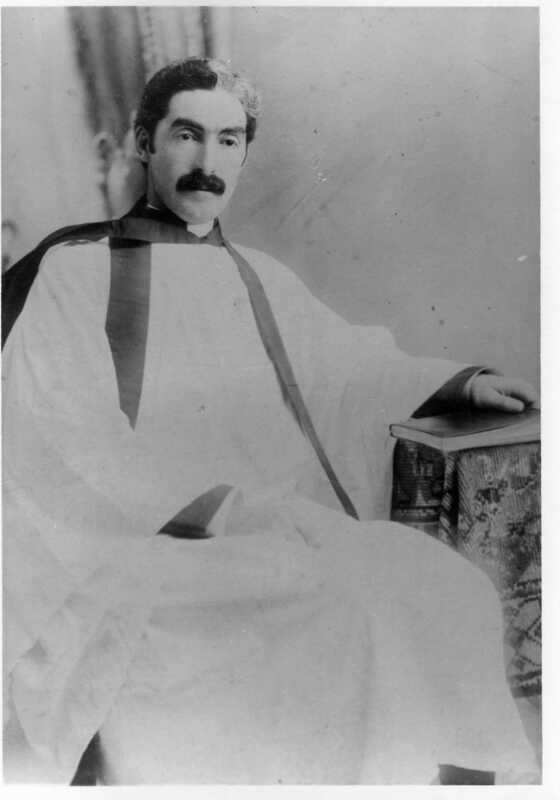 Shortly afterwards, Canon Morgan purchased a house on Tiffin St. and had it converted into a Sacred Mission Hall. Services were regularly conducted in this hall by Canon Morgan until his death in 1886. Both Rev. Murphy and Rev. Morgan were highly esteemed for the wonderful service they rendered to the community. After the death of Rev. Morgan, the Rev. Canon Reiner, of Trinity, Barrie, carried on the services in the hall for two years, and was followed by Judge Boys, acting as Lay Reader. Judge Boys held services until 1890, and was very highly thought of by everyone for his devoted service. The Parish by 1890 had grown so rapidly that it was necessary to engage a full-time cleric, so the representatives of the Parish approached the Vestry of Trinity with the request that the Curate whose work would be chiefly in Allandale be appointed to this work. This arrangement was made a very short time afterwards and the Rev. 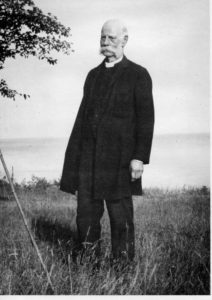 J.K. Godden, M.A., formerly of Beeton was appointed. With the appointment of the Rev. Godden, St. George’s could hold two services on Sundays, one in the morning and one in the afternoon. As the Curate at Trinity, the Rev. Godden also assisted at the evening service at Trinity. This close affiliation between St. George’s and Trinity lasted for a year and a half, and then on the sixth day of December, 1891, St. George’s became a separate Parish, with the additional responsibility for Minesing and Vespra (referred to as the Mission of Allandale, Minesing and Vespra. The congregation grew so rapidly that it was found necessary to erect a new and more “commodious” church to replace the mission Hall. Due in large part to enthusiasm of the congregation, within nine months, the cornerstone of the new church was laid on September 22, 1892. Never an easy job to draw up plans, finance and find a location for a new church, St. George’s stands today as a testament to their faithfulness, foresight and zeal. Laying the Cornerstone by Lieutenant Colonel Tyrwhitt, MP. The service began at 2:30 p.m. when the Rev. Canon Reiner of Trinity Church, Barrie; Rev. Mr. Scott of Cookstown; Rev. J.K. Godden, incumbent of Saint George’s Church, proceeded from the Mission Hall on Tiffin Street to the site of the new church on Burton Avenue, singing “The Church’s One Foundation”. They were followed by a large number of the congregation. The service for the occasion was read by the Rev. 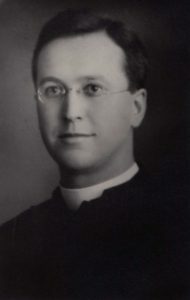 Canon Murphy, B.A., of Saint Paul’s Innisfil. In the course of the service an interesting and instructive history of Saint George’s Church was read by the incumbent, the Rev. J.K. Godden, M.A. This was followed by the presentation of a silver trowel to L.Col. Tyrwhitt by the Rev. J.K. Godden, with appropriate remarks. L.Col. Tyrwhitt then laid the stone, placing in the proper receptacle the customary papers of the day and coins of the realm. After the ceremony (Laying of the Stone), short addresses were delivered by the clergymen present and Mr. J. Holgate, Esq. At the close of the ceremony a tea was served in the Mission Hall on Tiffin Street, where a great many were present, enjoying the sociability which the occasion afforded. You can just visualize the unique sight it must have been to see this very notable group of clergymen and Church of England people, on a beautiful day in September, on parade going down Tiffin Street, along Essa Road, and down Burton Avenue singing “The Church’s One Foundation”. 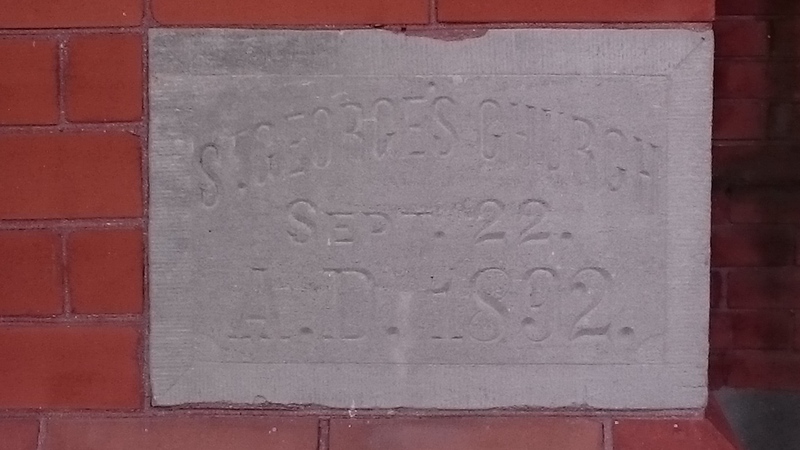 St. George’s Church was completed on 7 January, 1893 and the first services were held on Sunday, January 8, 1893. The sermons in the morning and the evening were delivered by the Rev. Dr. Langtry of Toronto. Trinity Choir, Barrie, under the leadership of Mr. J.C. Morgan, assisted in the music of both services. At the Sunday School service at 3:00 p.m., Rural Dean Kingston, of Penetanguishene, addressed the children. The financing necessary to erect such beautiful Gothic church was all done voluntarily. We celebrate the generosity of past generations when we today worship in this House of God. On Sunday evening last, long before the hour of service, St. George’s church was filled to its utmost capacity, lots having to go away and stand outside, the occasion being the confirmation of about 9 young ladies and 6 young gentlemen. The confirmation service was conducted by Bishop Sweatman, of Toronto. The young ladies were dressed in white, and looked very nice. The Bishop made some very appropriate remarks regarding confirmation. The Rev. Mr. Godden conducted the regular evening service. The Rev. J.K. Godden, who had accomplished a great work in the community, left in 1895 for new fields of endeavours. He was succeeded by the Rev. W.S. Westney, who laboured in this particular corner of God’s vineyard for six years from 1896 until 1903. The Rev. E.W. Murphy, who had seen the need here in Allandale some thirty years previously while rector of Innisfil, now became Rector of the Parish whose beginnings he fostered. He remained Rector until 1912. The Rev. E.W. Murphy was a Canon of Saint Alban’s Cathedral, was a Rector of Saint Paul’s and Saint Peter’s, Innisfil for 39 years, and Rector of Saint George’s for eight years. During the troublesome years of the Great War, the Rev. E.B. 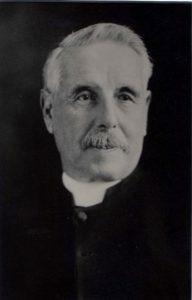 Taylor was Rector of Saint George’s. In 1915 the church was consecrated by the Diocesan Bishop on July 8th as the mortgage was cleared. In 1918, under Rev. Taylor’s leadership, another step forward was taken in the history of the Parish. The need of a Parish Hall was felt. Plans were formulated and out of them grew one of the first Memorial Halls erected anywhere in Canada. This hall, costing some three thousand dollars, was completely paid for by general subscriptions from all of the residents of Allandale. Used by all organizations of the church, and especially as a Sunday School, the Memorial Hall met an important need in the Parish. With the opening of St. George’s Parish Hall, Allandale, In October 1918, it was believed to be the first War Memorial in Canada. Through the loyalty of the parishioners of the church they had the satisfaction of knowing that they had been the means of erecting the first memorial in Canada to the brave sons of the Dominion who had given their lives in the First World War. Seven months before at a meeting in the Church it had been decided to erect a hall provided that $1,500 could be raised in two weeks. The appeal met with such a generous response that work was quickly put in hand and in the space of a few months the hall was opened. The use of the hall was for a Sunday School and for parish and other meetings. It was built of brick veneer, with cement facings, was of Gothic architecture. It had a seating capacity of 300. About 200 were present at the opening, which took the form of a concert. It was felt that after some criticism regarding building the hall during wartime they had been justified in that it was built as a mark of appreciation of the boys who had been sent to fight the battle of freedom, civilization and Christianity. The Rev. E.B. Taylor was followed by the Rev. Roy Melville in 1922. He had a positive impact on the congregation, and even 45 years later, people’s memories of him were still fresh in their minds. He was remembered especially for his work among the young people of the Parish. It was during the years of Mr. Melville’s ministry that the Choir Assembly Room was added to the church. The fine work of the Women’s Auxiliary must be noted here, for they contributed some seven hundred dollars to this welcome addition to the church. It was also at this time that a furnace was place in the hall through the efforts of Mr. Melville and his fine class of boys. Through their efforts, all of the necessary excavation was accomplished under the hall to make room for the furnace. This work was carried out in the same manner as the excavation of the Sunday School Hall with the new walls set in four feet from the old foundation and a weeping tile bed under the concrete floor and a connection made to the city sewage system. A washroom was added in the church basement at this time. An interesting part of this program was at the point when the sewer connection was to be made. It was found that the water mains and sewer mains on Burton Avenue were at the same level and the Public Utilities Commission volunteered to insert a ‘U’ in their main so we could get a connection for our sewer. All through this project the men of this parish, under the leadership of Stanley King, did yeoman service with the pick and shovel. As the work to the basement was nearing completion it was decided to make a rear entrance to the building to connect with the organist’s vestry. The bricks to cover this portion of the building were laid by Mr. Henry Hamel after the wooden frame, etc. had been completed by Mr. P. Trainor. The men had been busy starting excavation of the church basement and it was found that all of the floor joists had rotted out. The men of the building committee had to shore them up to prevent the floor from collapsing during Sunday services. The condition of the electric service in the church was such that a major renovation was necessary. Mr. Lorne Withers and Mr. Marvin Hobson volunteered their services providing that the church would purchase the materials. As a result, a new electric service was installed, completely re-wired and new lighting installed in the church itself. Mr. Dal Lee helped in this project during the later stages as the downstairs rooms were completed. An unfortunate incident happened when a fire of unknown origins started outside the door to the kitchen and before the fire department had it under control, the hall was almost a total wreck. Fortunately, just previous to the incident, the fire insurance on our buildings had been adjusted so that enough was realized to renovate the hall. At the same time, the hall was completely insolated and the old platform, which was the scene of many Christmas concerts and other festivities, was removed. In these years the Sunday School, as a contribution to the Christmas season, were in the habit of presenting a Christmas pageant of the Nativity. This script was originally written by the Rev. and Mrs. Newton-Smith and was staged in the church under the direction of Mr. Ed Norman and Mrs. I. Hobson.